I frequent what I have decided is my very favorite local coffee shop in North Park, San Diego, “Coffee & Flowers”: an amalgamation of hip businesses that includes the Native Poppy flower shop, Communal Coffee, and North Park Nursery. The space itself is “design goals”, for lack of a better cliche, with faux tulip tables and Eames molded plywood and plastic chairs to sit, work, or simply enjoy a piece of avocado toast and a lavender latte, and bouquets of fresh flowers from the shop. I know, I know, the extra is strong in that statement, but I truly have never found a coffee shop with such personable baristas, chic design inspiration, or a seriously delicious menu! When I can squeeze through the crowds into one of their window side benches and tables (complete with cozy shag rugs and geometric pillows), I work for a few hours, gobble a caprese toast, and soak in the decor. And did I mention they have merch? Communal Coffee has it’s own line of fun pins, mugs, and clothing with their logo, and Native Poppy has a selection of greeting cards, candles, and of course, a plethora of unique flowers. The space also features local artwork, one of which I just loved by Chelsea Virginia, a local San Diego fiber artist, and I wanted to highlight some of her gorgeous work. 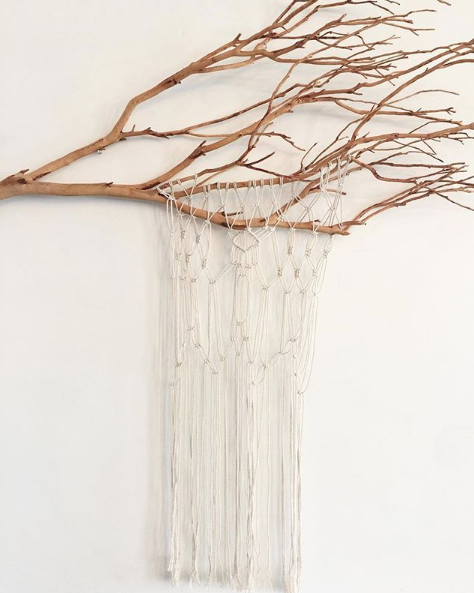 Chelsea creates hanging macrame & branch pieces, punch needle artwork, and macrame planters! You can find her work all over Communal Coffee or on her Etsy shop. I would love to do an actual post on Coffee & Flowers when time permits (I’m currently taking two studio courses, planning another shop, and getting ready for a new job I just accepted!). Will add that to my growing list of projects! The Tufted is an interior design, art, and lifestyle blog with a vintage, bohemian, eclectic edge. Enter your email address to follow The Tufted and receive notifications of new posts by email!